Well, that big bowl of passionfruit that I had sitting on the window sill started to ripen at various rates. I couldn't really keep up with the eating of them, and while some were delicious, some were a bit bitter, probably because they were not really ready to be off the vine yet. I thought about what I could make, and decided that passionfruit jam sounded amazing. It would be sweet enough to cover any bitterness, and would be like a little jar of bottled summer for use in desserts, baking or over my winter porridge. Winner! I'd never made jam before, so I needed something that would be fairly easy, relatively foolproof and not require any fancy materials. I had a search around for some recipes, then combined all the parts I liked to come up with the below. Store jam in the fridge. The recipe is scalable for different amounts of fruit - you boil half the skins and measure the appropriate amount of sugar out. No need to adjust the lemon. Do not add cold food to hot jars or hot food to cold jars as they will shatter. Sterilised jars are essential for preserving food without spoilage. An easy method I use when I don't have too many jars is to wash the jar, and leave it wet. Put it in the microwave without the lid for one minute. Boiling the skins and using the pulp is necessary because passionfruit don't have a lot of pectin and will not set with lemon juice alone. Do you make your own jam? What's your favourite type? Oh, this has taken me right back to childhood! 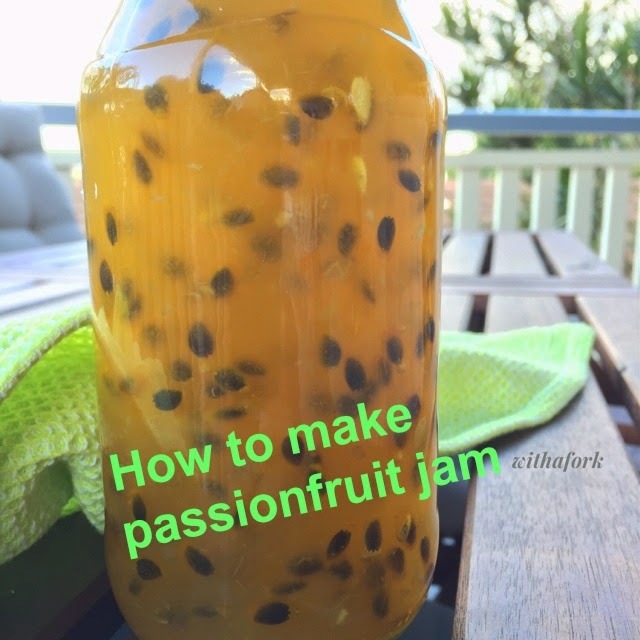 My Australian grandmother regularly made passionfruit jam from the fruit of their backyard vine and it looked just like yours at the end :) I bet it tastes delicious. I love passionfruit and imagine that passionfruit jam would be wonderful - I like your microwave method of doing the jars (though it would not have helped with my recent chutney making when E decided he should wash all my nicely sterilised metal lids just as I was about to jar the chutney). Your jam looks really beautiful. My last jam making was apricot jam. It is definitely a favourite of mine. Oh no!!! You can't get mad when they try to be helpful but sometimes it would be lovely to have a little less help! Apricot jam sounds amazing. If I manage to get ahold of a decent amount of it this season, I might have a go at making that too!